Pennsylvania Treasurer Joe Torsella announced that PA Treasury has expanded capabilities to the Transparency Portal by introducing new features as part of Phase 5 advancements. 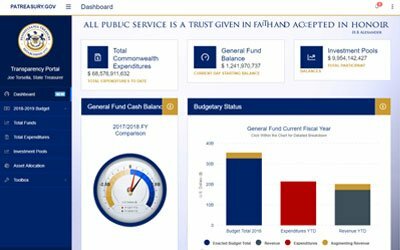 The portal will now provide the budgetary status for the General Fund along with collected revenue data. “It’s Pennsylvanians’ job to hold their government accountable, but it’s our job to make sure they have the tools to do so. With these new features, Treasury’s Transparency Portal lets users track data about their government’s finances more closely than ever before”, said Treasurer Torsella. With the updates, Pennsylvanians will now have the ability to view current fiscal year’s day to day General Fund budgetary status with a detailed breakdown of each department. In addition, Phase 5 enhancements include collected revenue classifications, available for the first time. The current general obligation bond debt is also now available along with a glossary of terms. Treasurer Torsella has led the transparency effort by creating Treasury’s Transparency Portal shortly after taking office. The launch of Phase 1 provided taxpayers with a first-in-the-nation ability to track the general fund balance in real time. Efforts to continuously increase capabilities have helped expand access of the Transparency Portal through Phase 2, Phase 3, and Phase 4.